We are back! We had a wonderful time. Jocelyn had a great week. What a blessing!!!! We added some new pictures but unfortunately we ran out of memory on the camera so we were only able to take pictures at the beginning of the week. Jocelyn went to the beach, pool, mini water park, aquarium, and dinner and a walk around barefoot landing. Poor thing isn’t gonna know what to do when she is stuck back at the house with me. ;P We are so thankful that we were able to spend time with so many of our friends and family. Sorry for the short update but it is bed time. I just wanted to be sure I added a quick update with the new pictures. Love Ya! Well! We did it! We took our first trip in Jocelyn’s new van. What a difference. She did great! God is good! It is such a blessing that you all have made this possible. We are so thankful to all. It was so much easier to do treatments and keep her comfortable as we traveled this time. Speaking of traveling. We had yet another great weekend. Mea and Shawn’s wedding was beautiful. We had a good time. It was good to get to spend some time with them and to visit with Miss Ashlee. We have plans to head to Myrtle Beach to spend time with family and friends this coming weekend. We will get to stay for a week. It should be lots of fun! Another GREAT weekend! We had more company this past weekend and were able to all go out to the beach/pavilion here in the lake to watch the fireworks. We had a great time. Jocelyn just LOVES being around other children. She truly seems to enjoy her friends. We added some new pictures. The girls were so good with her. BIG NEWS!!!! THANK YOU! We want to say how thankful we are to all of you for you help, support, contributions, gifts, time, etc. We thank the Lord every day for all of you! You have helped more than you even realize. With your help we have finally been able to get Jocelyn a van! Amazing! What a blessing!!!!!! So it came today. 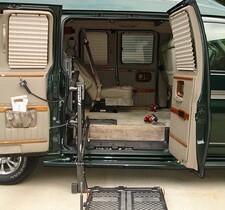 Already adapted with a wheelchair lift. This should make traveling with Jocelyn so much easier. And just in time because we will be driving to PA this weekend for a wedding and then to Myrtle Beach next weekend. We took Jocelyn for a quick little ride in it tonight. She did very well. I think her favorite part is the huge TV. But hey what ever makes her happy! THANK YOU! Praise the Lord! We love you!